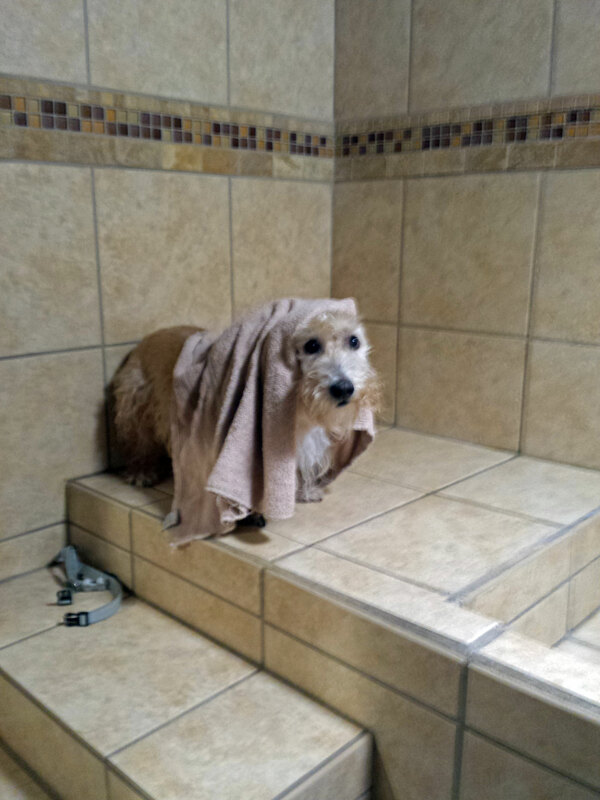 Last week, we decided to stop by the city of Brookhaven to visit City Dog Market, home of the best do-it-yourself dog washing station I have found yet. It had been months since we had gone to market (see photos here of Heather and Mr. K's last visit!). 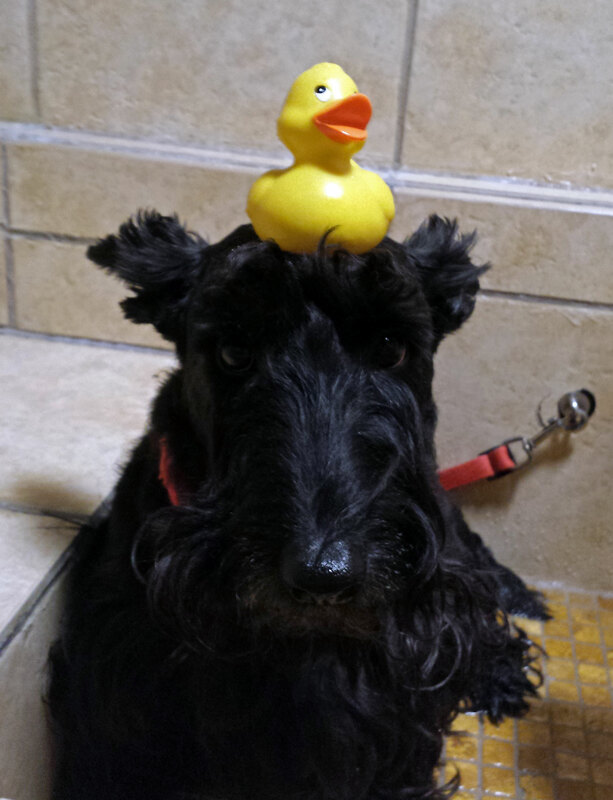 I'll admit, this Scottie Mom has gotten incredibly lazy about bathing the Scotties lately, opting to take them for full grooms and paying for the higher price tag these past few months instead of putting in a little elbow grease. With home improvement projects about the new Scottie House galore, it just seemed like a fair trade off for the work I was doing around the house. But who am I kidding? I've never been a fan of having to bathe the dogs myself so the choice to get full grooms was certainly an easy one! 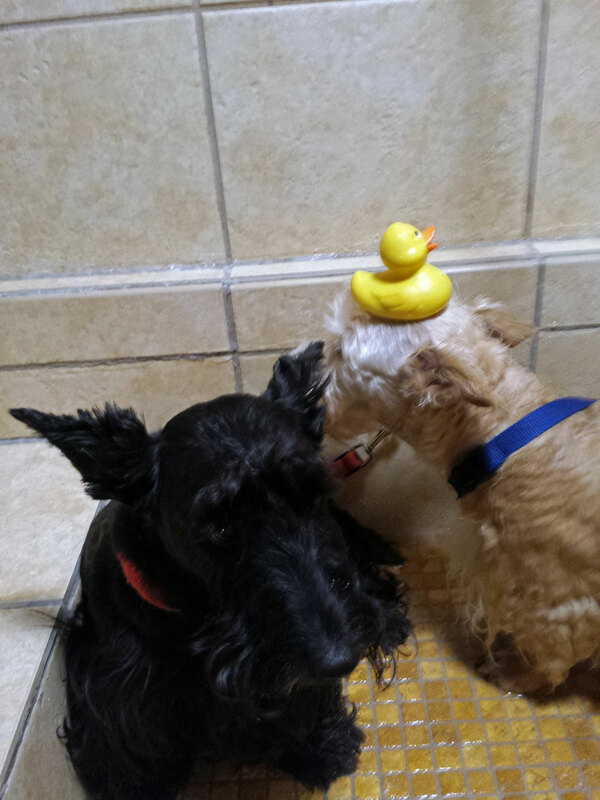 As the years go on, however, and these two get even more expressive about how much they enjoy (or don't) their baths, how can I not cherish these bonding moments that also happen to give me some pretty cute photos to share (and save me on average about $60 per visit)? The do-it-yourself dog washing station at City Dog Market is set up so that Heather and Mr. K can easily trot their way up the stairs (then try to zoomie back down once they realize there is a tub at the top of the stairs). The waist-level tub height makes it so much easier on my back since I no longer have to crouch by the tub at home. Plus, I'm pretty sure Mr. K and Heather prefer this set up, too. 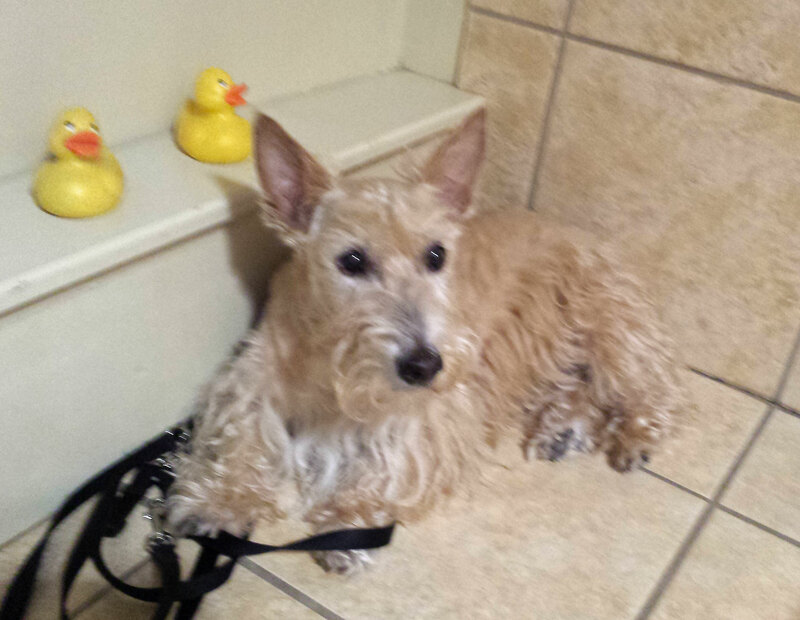 What Scottie wouldn't like to peruse the aisles of the market and select their treat(s) of choice after the torment of a dreaded bath? When life gets a little tough, it's nice to have Scottie House projects to keep you busy. Over the past few weeks, the fur kids and I have been moving from room to room working on various home improvement projects and surprisingly, they each have been rather therapeutic. 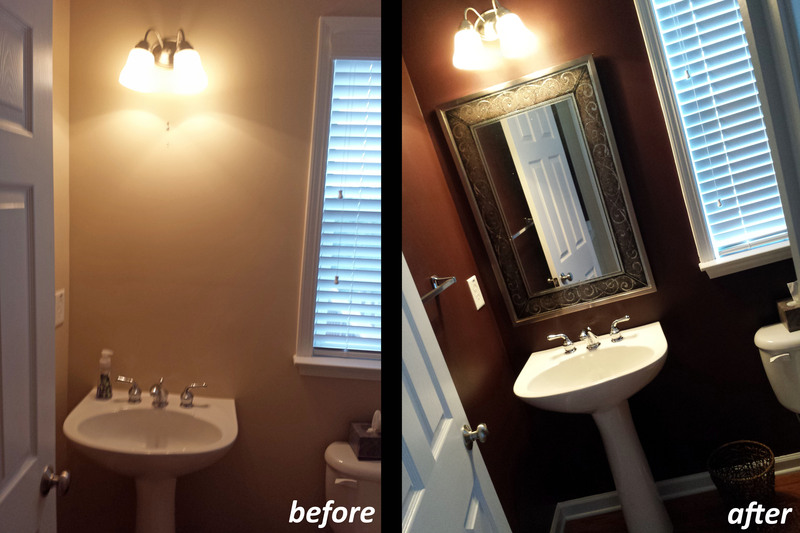 Mr. K was project manager of our very first paint job in the Scottie House: the half bath on the main floor. He selected the color because it was a close match to the color of his very first collar purchased shortly after he was rescued from Pets, Inc. Mr. K kept a close eye on things, letting me know when certain spots needed a little extra work and when it was time to pack up for the day. 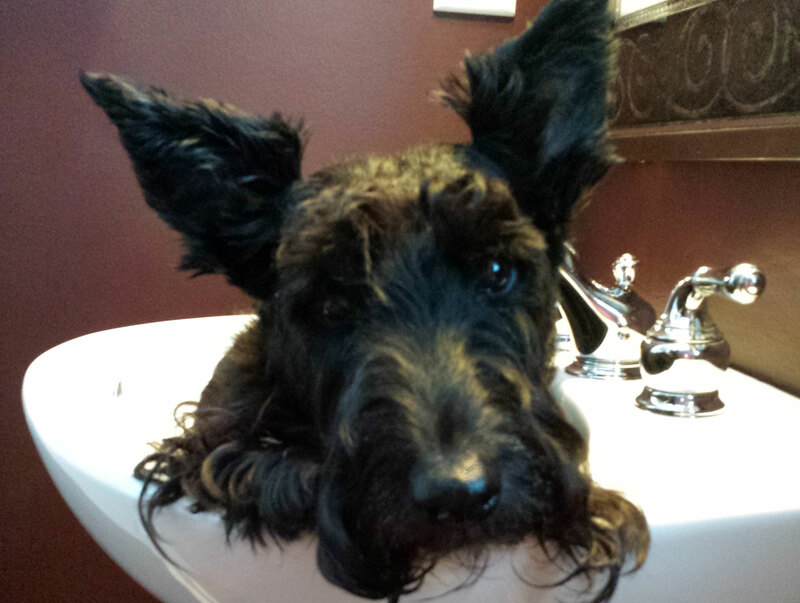 After all, a Scottie Mom can't spend all day on house projects...when's a Scottie supposed to eat and play? A job well done, Mr. K - you did good work! 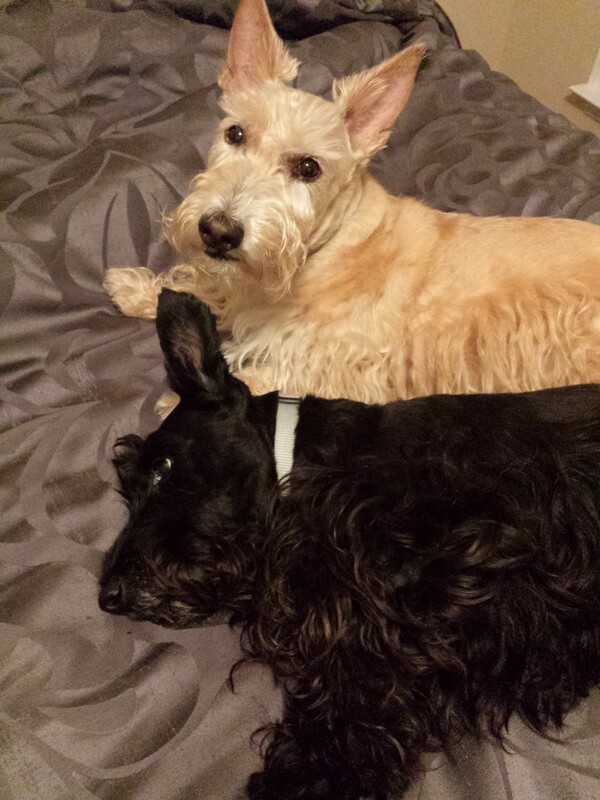 When I started ScottieMom.com, my purpose was to share my pups' health scares in order to continue my quest for some answers with the help of fellow Scottie Moms. What has become of the site is something much bigger than that simple task. 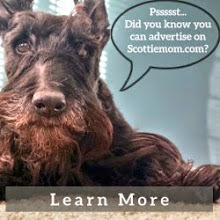 ScottieMom.com has since evolved into an international community of Scottie lovers, eager to read the adventures of the Scottie Mom crew and happy to share stories of their own. And this Scottie Mom is loving every minute of it! 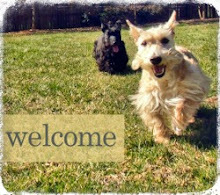 So, here's what I propose: let's meet the pups behind every Scottie Mom and Dad from around the world and see how many countries we find Scotties living in. 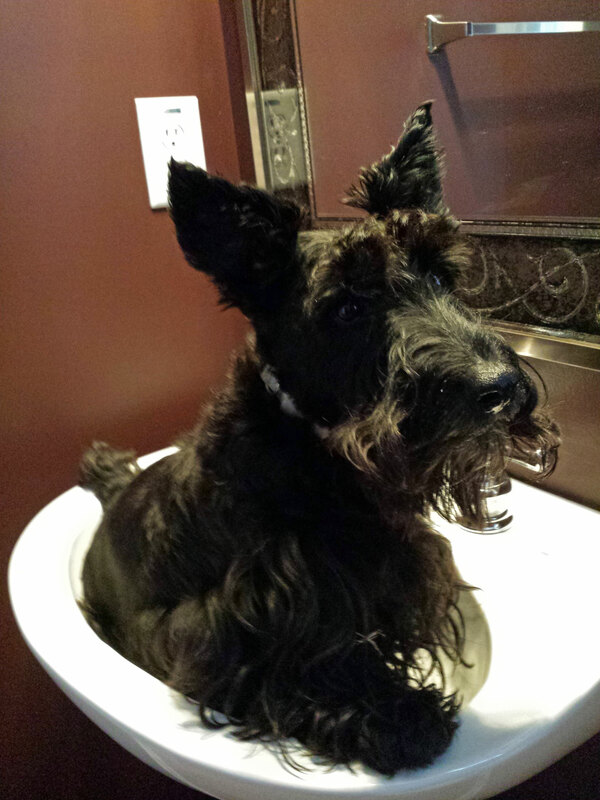 Submit your photo, the name of your Scottish Terrier and the country you live by posting to the Scottie Mom Facebook page or emailing us. If you're located in the United States, let us know in which state you reside. To date, we've collected over 200 photos of Scotties around the world and across the U.S.
Wonder what the most popular place for Scotties to live is (outside the United States)? 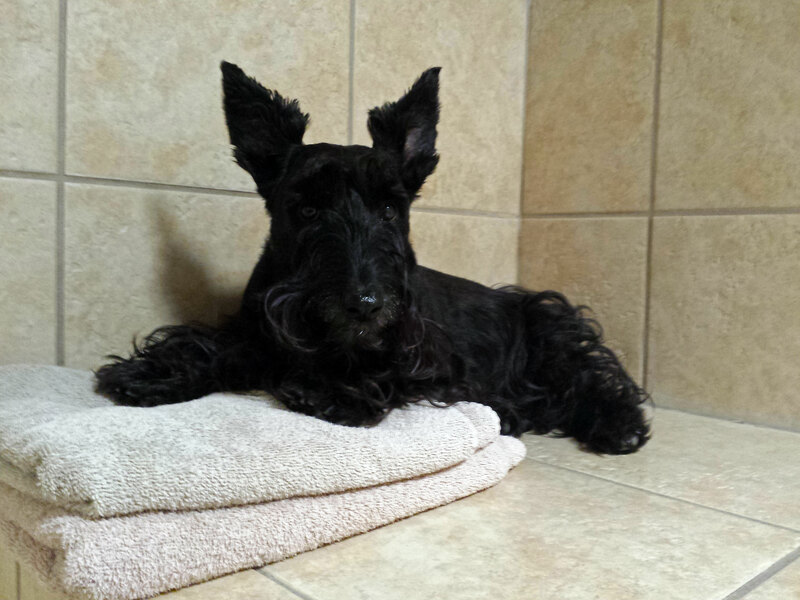 Based on the number of Scotties we've had introduce themselves from around the world, that place is Peru! 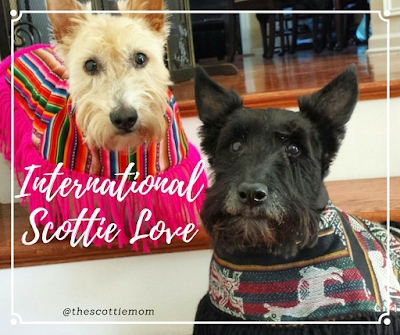 No less than 35 Scotties from Peru have come forward to showcase their International Scottie Love. 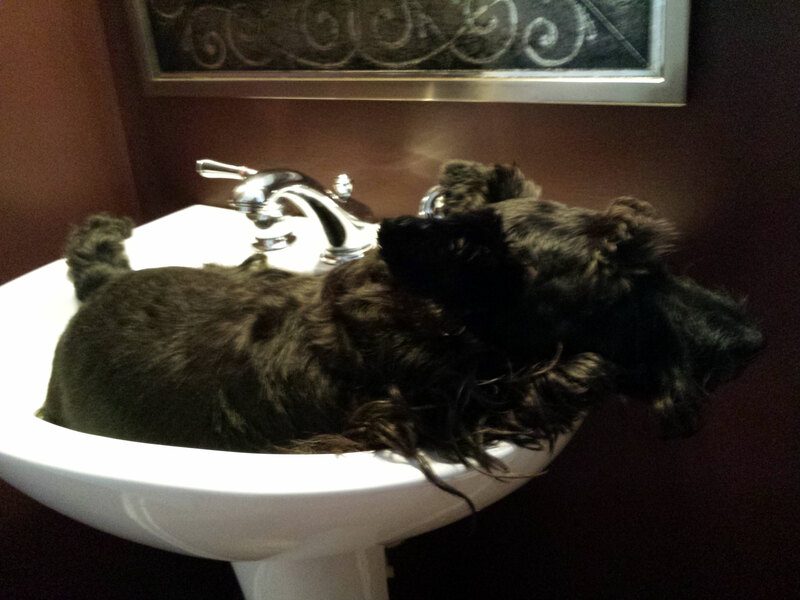 Not far behind them is South Africa, with 23 Scotties showing off their cute selves! Tied for third place is Scotland and Canada, each having five Scottie representatives at this time from their country in our International Scottie Love competition. Think your country's got Peru beat? Send us photos! 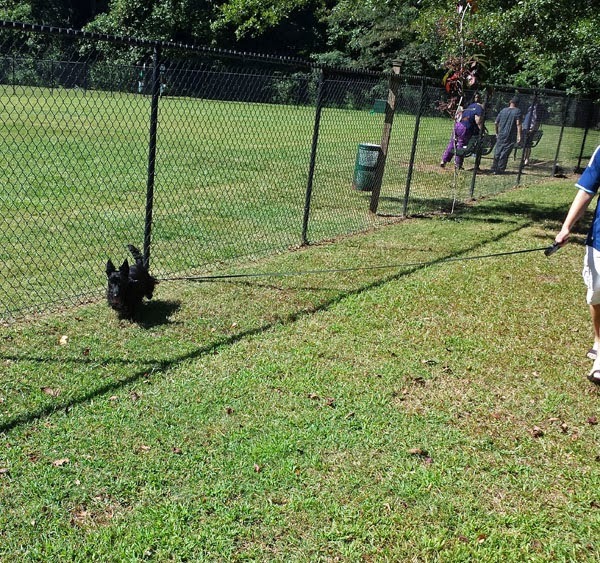 Our stateside friends have introduced us to hundreds of Scotties so far. More than 30 U.S. states and terrier-tories are represented. 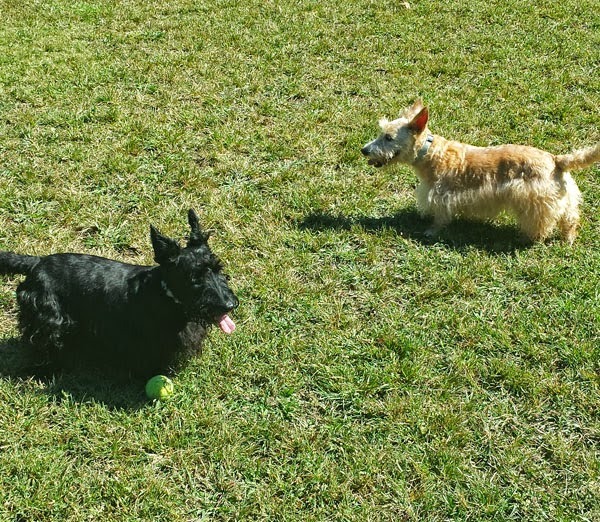 California leads the way with 12 Scottish Terrier representatives and Virginia is just three Scotties away from taking the lead as the most popular state. Florida is in third place with 10 Scottie representatives and behind them are Texas and Washington tied at six Scottie representatives. 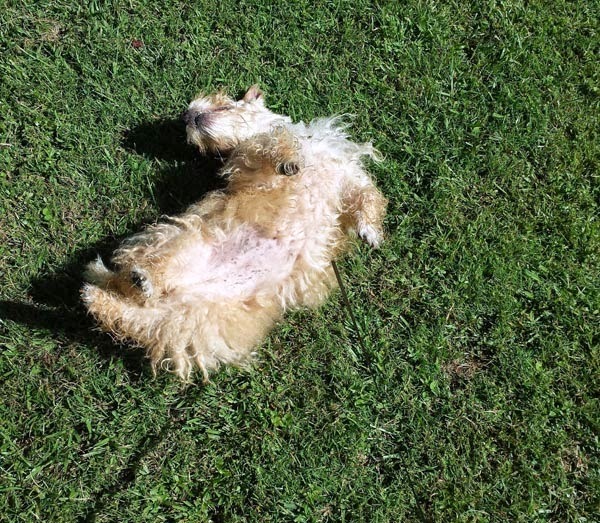 Let's see if we can find Scottish Terriers living in every state! 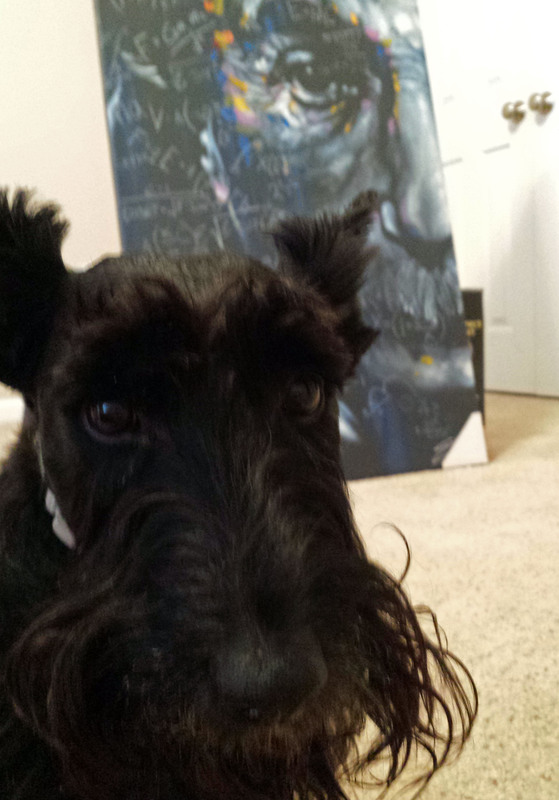 What is this place, Scottie Mom? It's a glorious place for back scratchin's, that's for sure! 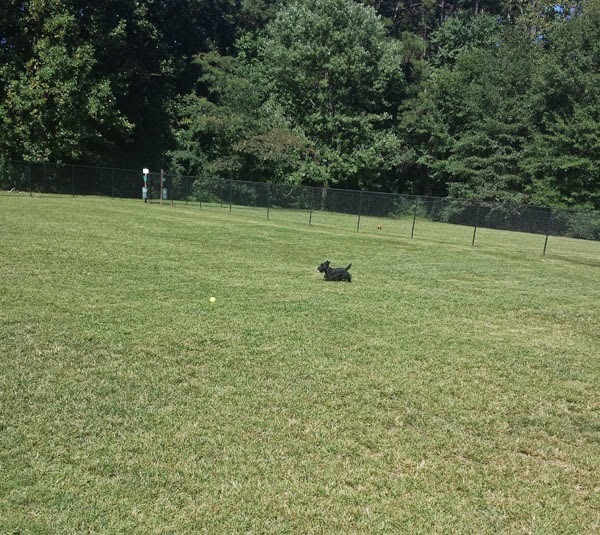 Mr. K doing a few laps around the park with Scottie Dad. What's this? 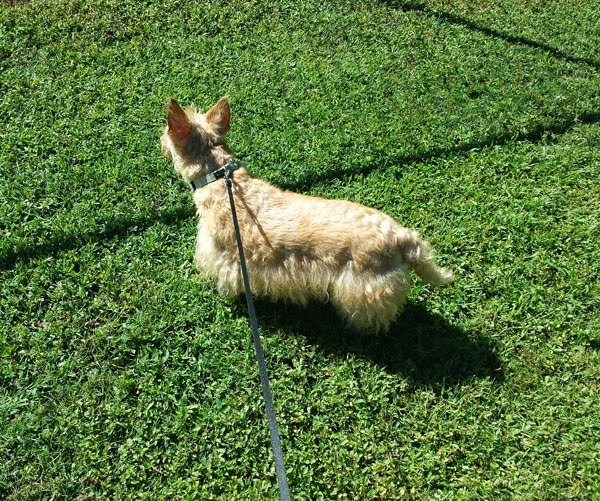 Mr. K was allowed to be off-leash for good behavior?! 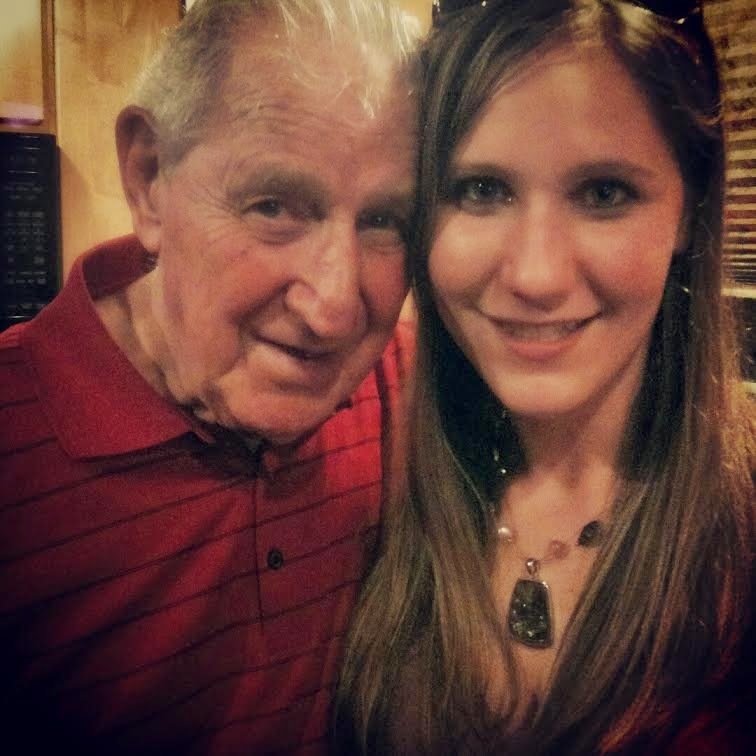 ...but, like any good brother, he didn't forget about me. 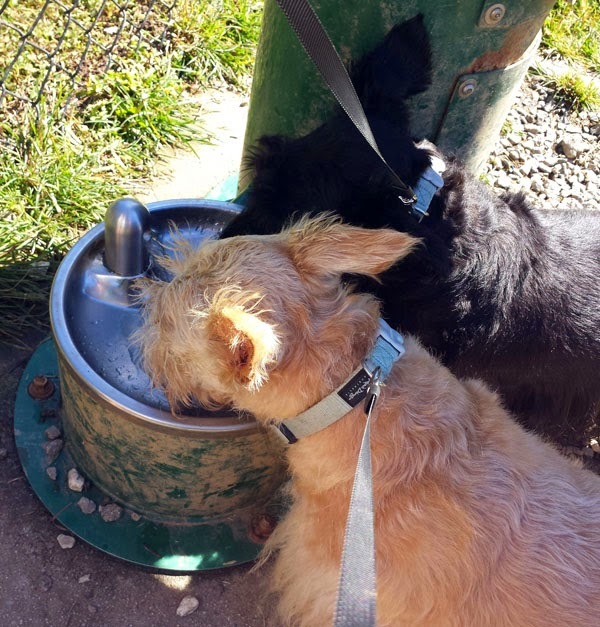 And together, we finished the play date by sharing a nice, cool drink! Why is it that during the week I can't seem to get enough sleep to keep me going but when the weekend comes around, the last thing I'm able to do is sleep (which is ironic, since I actually have the time)? 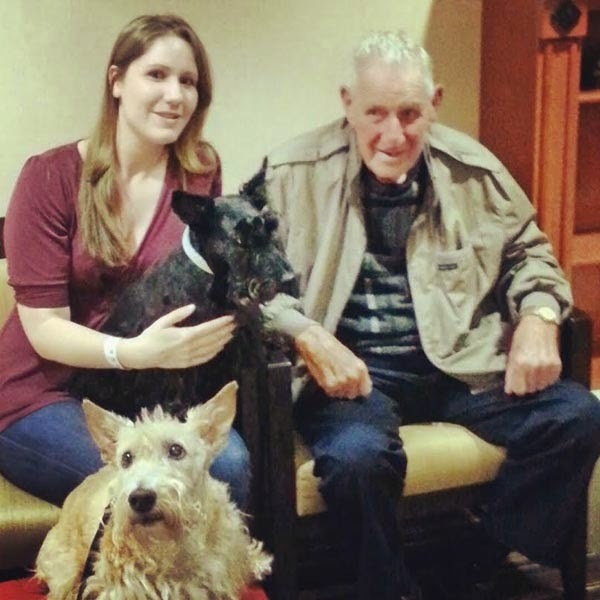 On Friday, I went to bed around midnight, shortly after taking Heather and Mr. K on their last walk of the day. Two or three hours and lots of tossing and turning in bed later, I still couldn't sleep so I left Scottie Dad - who had long been fast asleep - in the master suite and walked across the hall to the guest bedroom, also known as the Scottie Suite. I called upon Heather and Mr. K to join me in the Scottie Suite so the three of us could watch television in the wee hours of the morning together. Heather settled on my feet and Mr. K propped his front paws on my stomach. There we were, watching recaps of baseball games until 3:45 a.m. when, mercy found me and granted me some sleep no less than 10 or 15 minutes after Heather and Mr. K closed their eyes for the night. 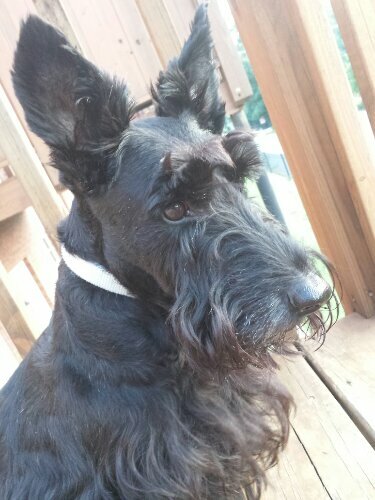 By the time I finally started dreaming sweet dreams of my own, I bet I was so delirious I dreamed Scottie Dad would let me rescue more Scotties! It's late at night. Just shortly after 11 p.m. There's a clippity-clap of paws and claws hitting the pavement. The sound echoes a bit. No other noise permeates the air. Two tails are sticking straight up toward the sky, wagging slightly as we go. We are guided only by a few, soft street lights as we march, march, march around the block. There's not a soul in sight. We are the last to conduct our nightly round of neighborhood watch. Mr. K looks to the left, Heather to the right. Satisfied with what they see, we move on until the next scene of investigation. We're close now, almost back to The Scottie House. We pick up the pace. Heather knows there's a treat waiting to greet her at the door. Mr. K hurries along, too. Then, fast as a flash, he somersaults forward and lands on his paws. He doesn't stop. He keeps going and never misses a step. There's a certain air of pride about him now, as if he's just accomplished a major feat. Confused, Heather and I look at each other and wonder what that ninja move was all about. We hang back and watch him for a second but he's marching along just as fast as could be. He must be eager for his treat. 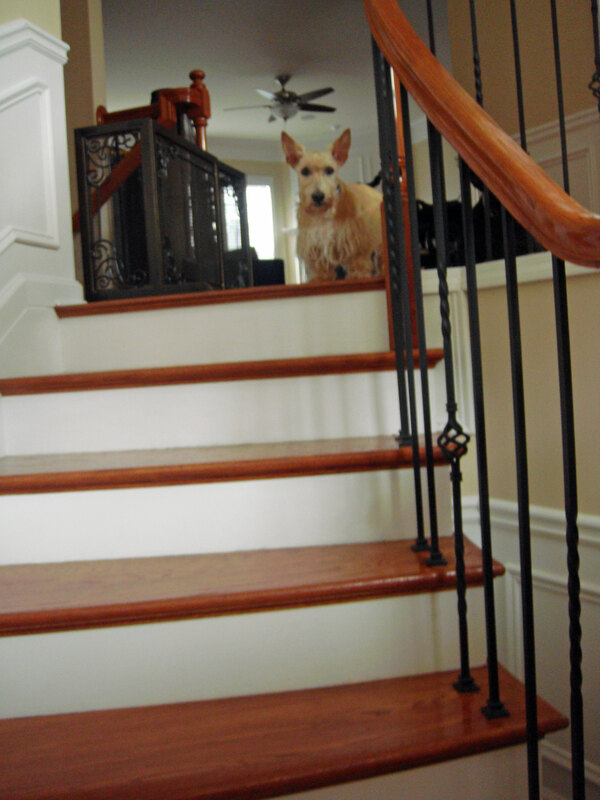 At the foot of the steps, Mr. K props one paw up and begins trotting his way up the stairs. Heather goes straight to the top. Mr. K stops at the landing. He looks left. Then, he looks right. Finally, he looks up at me and then down to the ground. His mouth opens. Out drops his prized possession - the very reason for his ninja moves: a cockroach. It doesn't move. Mr. K nods, visibly proud that he had saved the world from one squirmy nuisance. Tongue hanging out, Mr. K sits down and looks up and smiles, as if he is waiting to be praised. Fast forward three hours and it is now the middle of the night. All are asleep in The Scottie House. Mr. K on my lap, Heather on my feet. 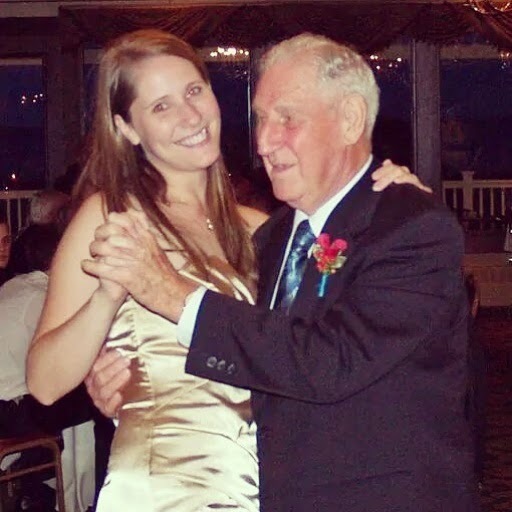 Suddenly, without warning, Mr. K's head snaps up and he flies off the bed - waking me as he goes. No big deal, I say to myself, and I roll over to again rest my eyes. POW! My eyes shoot open. POW! POW! I turn around. What is Mr. K doing and why so much noise at this hour? I look on the side of the bed. Again, his tail is sticking straight up in the air. This time, however, it is wagging feverishly. He slaps his paw down again on the floor. POW! Two seconds later, he shuffles to the right and does it again. Oh no, I think, he's hunting something. Do I dare climb off the bed and see what it is? Scottie Dad is not around to pick up whatever is under attack right now. What if I accidentally step on it? Gross! I peer down at Mr. K, who is still POW-ing and wagging his tail excitedly. 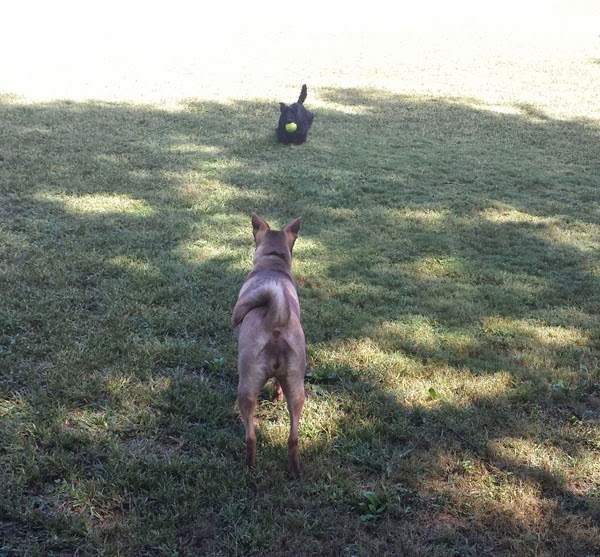 Surely, this ninja Scottie is winning his war. I scramble to switch the light switch on. Light fills the room. What did I see? Yet another cockroach who would give anything to flee from the ninja Scottie!